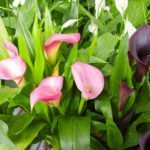 Why are my calla lily blooms closed up? I received a calla lily plant for Mother's Day that was almost dead. I planted it and within a few days it had the most beautiful blooms. Within a week or so the blooms closed up and have not opened in about two weeks. I live in climate 6b. It has the morning sun. Is it possible it is not getting enough sun? Any other suggestions would be appreciated. Thank you.